This post is brief background to a longer piece that views Roosevelt’s economics through his impact on Washington D.C. The economic statistics show his initiatives brought the US great depression to a decisive end; they also stabilised the deterioration in the public sector finances. Yet the efforts can be dismissed as trivial. A former Chair of the US Council of Economic Advisers claimed: “… the total fiscal expansion in the 1930s was very small indeed” (Romer, 2009). This type of assessment follows the widespread error of using the public sector deficit as a guide to the extent of fiscal policy. The deficit reflects the outcome of fiscal policy, not the setting of fiscal policy. In particular, the deficit will incorporate any reductions in benefit expenditure and increases in tax revenues that follow as a consequence of public expenditure programmes. The related conception of ‘deficit spending’ is a misnomer, that inherently distorts the arguments of those in the 1930s – not least Keynes (see here). The obvious way to examine the extent and effect of public expenditure programmes in the 1930s is through historic national accounts figures. The first chart below shows GDP growth (Y) recovering alongside the significant expansion in general government expenditure (G=current and capital, growth rates of cash figures). Unemployment began to improve in parallel, as did key public finance statistics. While the deficit was not increased beyond that inherited from Hoover, spending growth under Roosevelt (ahead of the war) averaged 8% a year through to 1939 (14% over 1934 to 1936). 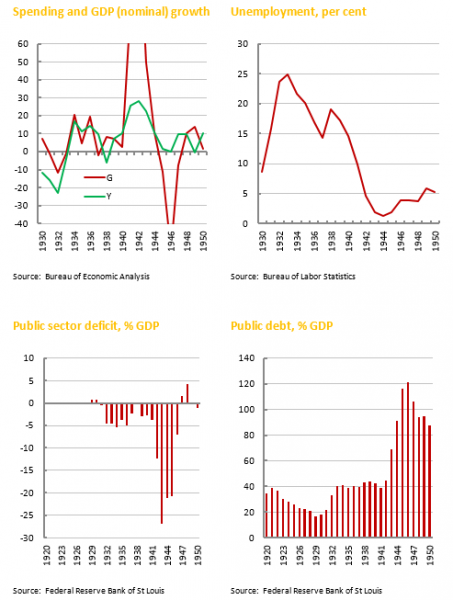 The rise in both the public debt and deficit as a share of GDP were arrested, the result of turning the economy around. While ultimately inadequate to resolve fully the unemployment crisis, these policies were doubtless opposed throughout by vested interest as well as conventional economic opinion. The scale of achievement might be illustrated by contemporary events: in the face of not dissimilar forces, the same measure grew by only 3% a year over 2009-15 under President Obama.